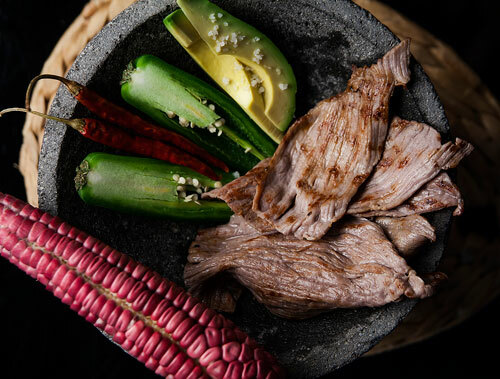 The Yecapixtla cecina has international level fame, due to the traditional and artisanal process that is followed in its elaboration and especially for its unbeatable flavor and quality. This dish originally from the municipality of Yecapixtla, Morelos is without a doubt an icon of the Mexican culinary art. The preparation technique of this beef has more than 200 years of tradition and it emerged in Yecapixtla because all type of meat was sold there and the leftovers were salted – that’s how the cecina was born. The cecina preparation is a whole ritual because it is prepared by hand, there are no machines in the process, and to make this ritual more interesting the beef is cooked with salt and exposed to the sun. The cecina is served as main course and it can be accompanied with some Mexican cream, cheese, pot beans , your favorite salsa , a good avocado and the indispensable tortillas. With this you will have a delicacy served on your table. The beauty about this recipe is that you are going to prepare it in an “artisanal" way, like a true Yecapixtla artisan. Remember that this beef is cooked with the sun therefore you will have to prepare it in a sunny day. The best cuts for this preparation are the leg and the beef tenderloin. Make sure that the fillets are very thin as it is a characteristic of the Yecapixtla cecina, it is thin and easy to chew. In this recipe you will have to be creative because the cecina is hung. The preparation time depends on the sun but it can take from 30 minutes to 1½ hours. Recipe for 2.2 lbs of cecina. Remove the fat of 2.2 lbs of beef. Cut into large, wide and thin strips; all the beef with the one you worked, then set aside. Sprinkle uniformly over a work table 2 tablespoons of salt. Put the beef strips that were cut over the salt that was sprinkled. Sprinkle uniformly over all the beef strips 2 tablespoons of salt, until it has a small salt layer that covers the beef. If necessary add more salt. Take the work table to the sun and let the sun and the salt cook the beef strips for about 3 - 30 minutes, until they are lightly cooked and they turn to a light brown color. Preferably cover the beef with 1 large plastic bag to protect it from animals and insects. In this cooking process, we recommend not to be guided by time but by the beef coloration since it is a process that also depends of humidity. Turn all the beef strips that were cooked and repeat the previous step. Take the beef strips into the shade, in a closed and fresh room. Hang all the beef strips with some clothespins for about 30 minutes, until they dry. Take all the cecina strips and smear on them on both sides, with a spoon, 5 tablespoons of lard; then set aside. The lard helps the cecina not to stick when it is cooked and it also gives more flavor. Heat in a frying pan over medium-high heat 1 tablespoon of vegetable oil. Put in the frying pan the cecina strips that fit in and fry them for about 2 minutes per each side, until they are well cooked; then serve them. Repeat the same procedure with the cecina strips that were not fried, it will be necessary to add in the frying pan more vegetable oil. Variation: If you liked this cecina... wait ... there’s also the spicy cecina. Try it you will love it! Did you like Yecapixtla’s Cecina? The “Goya Lard" gives a very good flavor to the food and its texture is excellent for cooking. To make the cecina you have to do many precise cuts and there is no better way of achieving them than with the “Victorinox Set of Knives". This knives are very sharp and they have a very good balance – your cuts will be perfect. As you are going to do many cuts, buy a firm and solid chopping board. You will find this qualities in the “Breville Chopping Board"; as it is made with bamboo, which is very strong, resistant and the best is that the board has antibacterial properties.